Last night we had an appointment with our tax guy at 9 pm! He's a busy man... to pass the time, we visited The Container Store and Marshall's for the first time. Allow me to start with The Container Store... I really wasn't impressed. As much as I love containers, boxes, files and closet organizers, I didn't find The Container Store to be anything special. Did I mention the prices? I knew IKEA was down the street and I could find the exact products for much cheaper. Now on to Marshall's... I know I've expressed my love of HomeGoods in the past and I must say it is still a front runner, BUT, Marshall's is a close 2nd! They have great prices, great items for the house and great everything else! 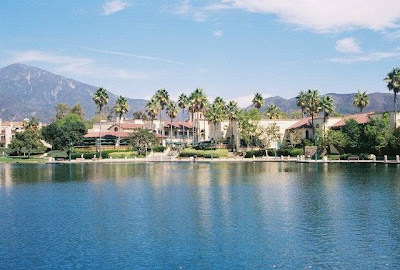 This past Sunday, Mike and I decided to visit Lake Rancho Santa Margarita. We've driven by. watched the 4th of July fireworks, but we've never actually walked around the lake during the day. I must say it was beautiful and I was sad that we hadn't visited sooner. The weather was perfect, the trail was nice, the people were nice and there were dogs and ducks everywhere [yes, we brought our beloved pooch along with us]. Half way through our walk we noticed a table set up with free coffee, water bottles and dog treats! It was awesome! We hope to visit every Sunday morning. Like I told Mike: We pay for this! Good old mello roos!